General Mariano Guadalupe Vallejo; born in Monterey July 7, 1808; died in Sonoma January 18, 1890. Married in San Diego March 6, 1832, to Francisca Benicia Carrillo. 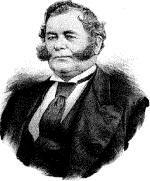 In 1850 General Vallejo promised land for a city that was later named after him. 1854 saw the beginning of Mare Island Naval Shipyard. The first West Coast Naval Shipyard. Located across the Napa River (Mare Island Strait) on the western side of Vallejo. The Island was named after an incident that left one of Vallejo's favorite mares in the water during a transporting process of some of his horses to the Island. Prior to the 1830's, the countryside where the City of Vallejo now stands was inhabited by the Suisun and Karkin Indians. 1835, a Mexican military officer, Mariano Guadalupe Vallejo, was sent to the northern California frontier where he established several land grants. One of these grants, the Rancho Suscol, included the area where the cities of Vallejo and Benicia are now located. Soon After Chief Solano, the leader of the Suisun Indians, allied himself with General Vallejo, an alliance which allowed the region to remain primarily inhabited by Native Americans until the 1840's. In 1850, after California had been admitted to the Union as the 31st state, General Vallejo donated 156 acres of his land and promised the sum of $370,000 to create his dream of a thriving new state capital. In 1852 the City of Vallejo becomes the first permanent seat of the newly established state of California. In 1853 the United States Navy purchased Mare Island for the creation of the first naval installation on the West Coast. The museum houses two floors of exhibits and information about Vallejo and Mare Island, and even includes a working WWII submarine periscope.